Apricot chicken is a unique dish that will please both kids and adults alike. Serve your chicken over rice pilaf or mashed potatoes for a complete meal. This site doesn’t have a lot of slow cooker recipes, mostly because I’m not the biggest slow cooker fan. 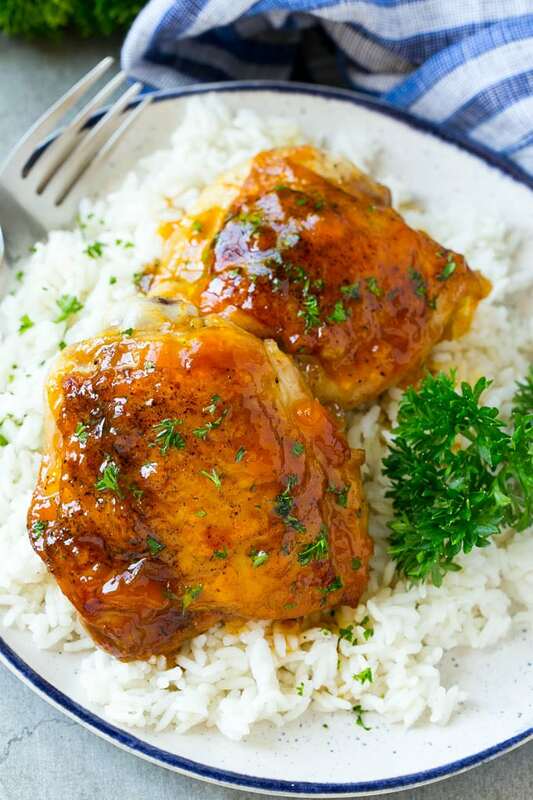 That being said, this slow cooker apricot chickenis FABULOUS and you’ll love it, even if you’re like me and you don’t use your crockpot that often. The sauce is what makes this dish special, it’s sweet, savory and tangy, all in one. And don’t even get me started on the melt-in-your mouth chicken! 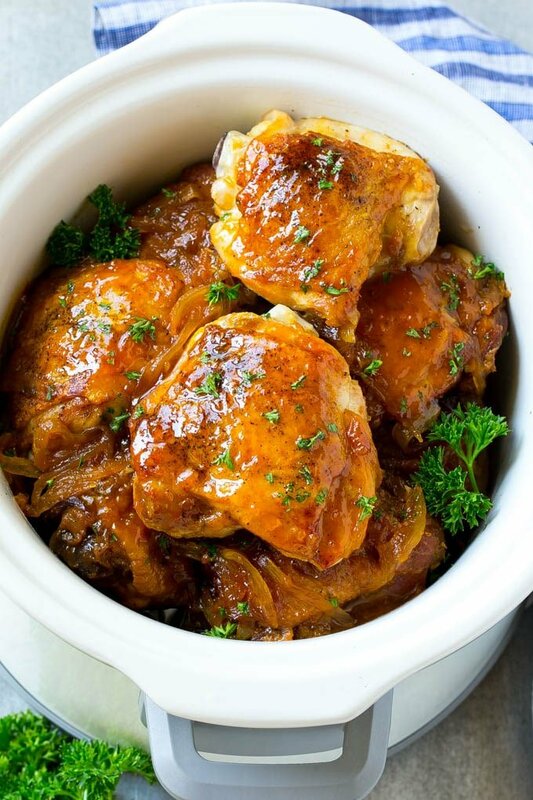 How Do I Make Slow Cooker Apricot Chicken? I use bone-in skin-on chicken thighs for this recipe, primarily because the bones add a lot of extra flavor during the slow cooking process and the skin helps to keep the moisture trapped inside each thigh so you don’t end up with dry chicken. You can use boneless skinless chicken thighs if you prefer, or simply follow the recipe as directed and peel the skin off before serving. I’ve never tried this with chicken breasts, but I would imagine it would work just fine. I like to brown my chicken before I put it in the slow cooker. This is an optional step, but it adds SO much extra flavor in my opinion. I brown the chicken thighs on both sides, then add the onions to the pan to soften. 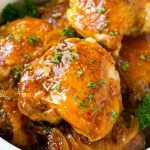 The chicken and onions go into the slow cooker and are topped with a simple yet delicious sauce of apricot preserves, soy sauce, mustard and ginger. I like to serve this slow cooker apricot chicken over rice. Add a salad or green veggie and you’ve got a complete meal with minimal prep time! This apricot chicken really is one of the best slow cooker meals I’ve had. The chicken just falls off the bone and that sauce is the perfect blend of sweet and savory. Try it tonight and watch the rave reviews pour in! In a small bowl, whisk together the apricot preserves, soy sauce, dijon mustard and ginger. Set aside. Heat the olive oil in a large pan over high heat. Season the chicken thighs on both sides with salt and pepper. Place the chicken thighs skin side down in the pan and cook for 4-5 minutes on each side until deep golden brown. Add the onions to the pan and cook for 5 minutes or until softened. 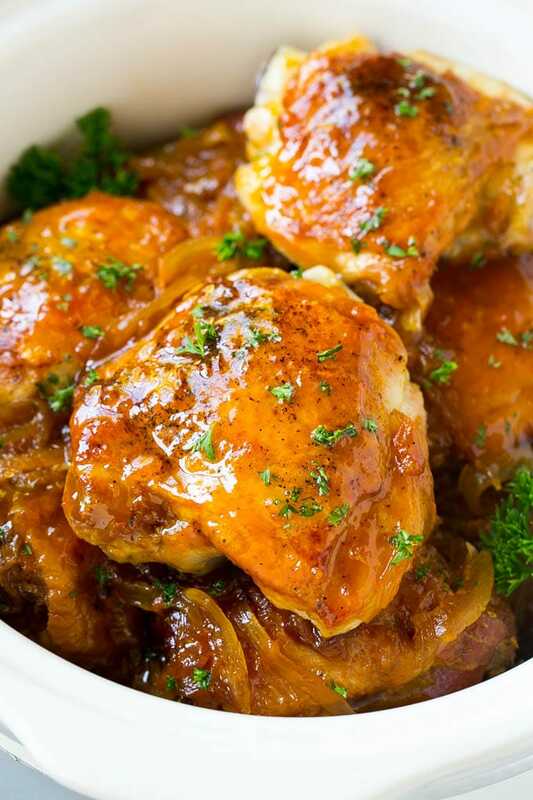 Place the chicken thighs and onions in a slow cooker. Pour the apricot sauce over the chicken and onions. Cook on LOW for 6-8 hours or HIGH for 3-4 hours. Sprinkle with parsley and serve. Adapted from A Year of Slow Cooking. Nutritional information includes the chicken skin; if the skin is discarded the calorie and fat count will be lower. So delicious! second time making it tonight. I did high for 4 and a half hours and was perfect! You may want to use sugar free apricot jam to keep the carb count down! It’s fine to add them at the beginning! Can I substitute for boneless chicken breast? Yes you can, although you may want to reduce the cook time by an hour to avoid drying out the meat! Great, easy recipe. I saw your comments and made it on the stovetop/oven and it came out perfectly. I made this last night and followed the recipe exactly. It was great! Looked and tasted fantastic. Both my picky eaters (three and six) finished their dinner! We’re using leftover for lettuce wraps tonight. One of the few slow cooker chicken dishes that I’d add to the rotation. Thanks! 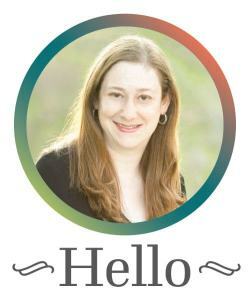 I made this last night & my husband & I really liked it. I used 8 bone in skinless chicken thighs because I had froze 4 per package. I did not cook the chicken or onion in a pan first. (I just prefer to keep the cleanup to a minimum.) Served it over rice. We really enjoyed it & rated the recipe as a keeper. Looking forward to leftovers tonight! I did this in a slow cooker for the prescribed 8 hours on low. When I returned, t was a burnt mess when I came home after 7 hours. I may try it in the oven as another reviewer suggested, or not. I also agree with the reviewer who commented on those reviews that add remarks without trying the recipe – that is an absolute waste of time to anyone considering the recipe. I’m sorry that you had a bad experience with this recipe, I tested it at both low and high heats and it came out ok for me both times. All I can think of is sometimes slow cookers can run hot, depending on the brand and the age of the slow cooker. I tested this recipe with a brand new slow cooker so maybe there was some discrepancy there. I’ll test the recipe again, thanks for your input. Although no one has tried this they all awarded it 5 stars! From now on I’ll read the comments before I look at the “ratings”. I’m from New Zealand so I’m a little unsure of what apricot preserves is? Is it apricot jam (apricots + sugar and water cooked then jarred)? Or more like an apricot chutney with savoury flavours (onions, spices etc)? Or canned apricots? Thanks in advance, since this recipe looks super delish, and I’m sure my family would love it!
. Flavor wise the sauce is delicious but the chicken may melt in your mouth but it also falls apart making a unattractive mess when serving. Also it looked nothing like the photo when done. So i tried it several other ways. Personally i feel it defeats the purpose of the slow cooker, if your gonna dirty a pan and waste 15 min cooking/browning the chicken (as thighs are naturally tender and moist they dont benefit much from long slow cooking). So i decided i might just as well add sauce and; either put lid on and continue cooking another 20 min or finish in oven @ 375 for 25 30 min uncovered. We tried both and the oven version looked nearly identical to your photo. Lot less dirty dishes and no messy crock pot to clean. Also served with parsley potatoes which finished up at the the same time. Thank you for the recipe it is a keeper. I prefer to use boneless, skinless chicken breasts, would the same directions/instructions apply? I haven’t tried it this way, but it should work the same. Or you could skip the browning process since it will partially cook a thinner cut like a boneless skinless breast, making it more susceptible to drying out in the slow cooker. Any adaptations for an Instant Pot or Pressure Cooker? What do you recommend serving with this asa aside as far as veggies go? I usually serve over rice with a side of steamed broccoli or green beans! Asparagus..broccoli..cauliflower..roast in oven. I also like peas or corn with it. Oh my, this looks o good! Chicken thighs are always so tender and slow cooking would really make them even better. My wife really enjoys slow cooker meals in the fall and winter. So easy to enjoy and we make enough for more than 1 meal. Makes my mouth water! I’m a big fan of the slow cooker! Really nice to come home to a cooked dinner after work! I do not have a slow cooker. Can this apricot chicken be baked in a regular oven? If so, at what temperature and for approximately how long? Yes it can! After you sear the chicken and onions, pour off any fat then add the sauce to the pan. Cover the pan and bake at 350 for 45 minutes. I would suggest a 375-degree oven for 50 to 55 minutes.